Hey y’all! I hope you are having a good week! This past weekend, I made a delicious and easy broccoli salad for our church potluck. This broccoli salad recipe is from my mom and I modified it just a tad to reduce the sugar. 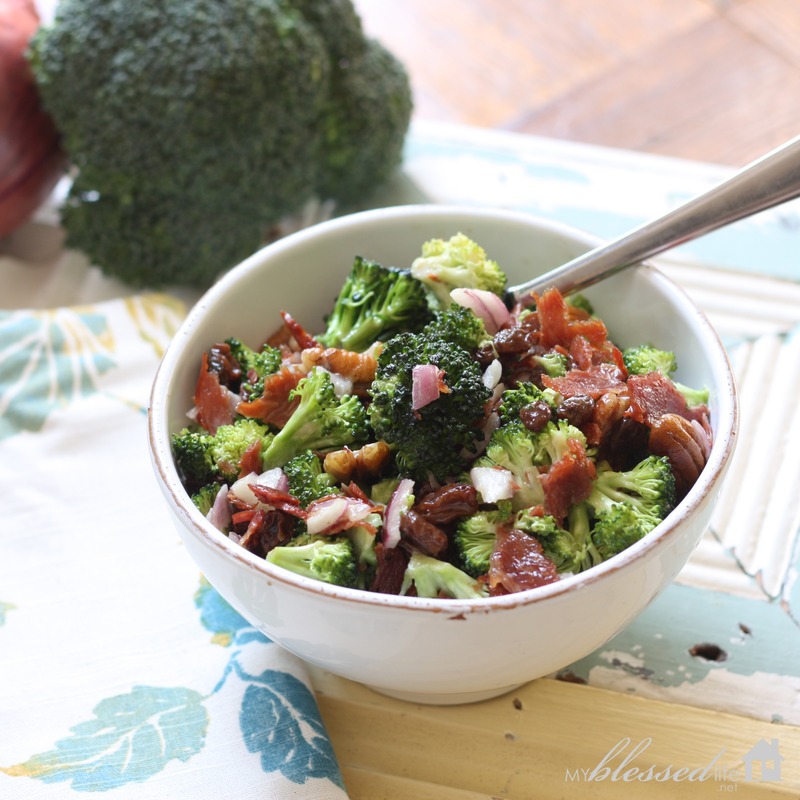 The crunch of the broccoli and sweet raisins with the tangy onions and dressing is a delicious combination. Combine mayonnaise, sugar and apple cider vinegar in a bowl and refrigerate overnight or at least for several hours. Gently mix remaining ingredients in a large bowl. Pour dressing over and toss. Chill and serve. 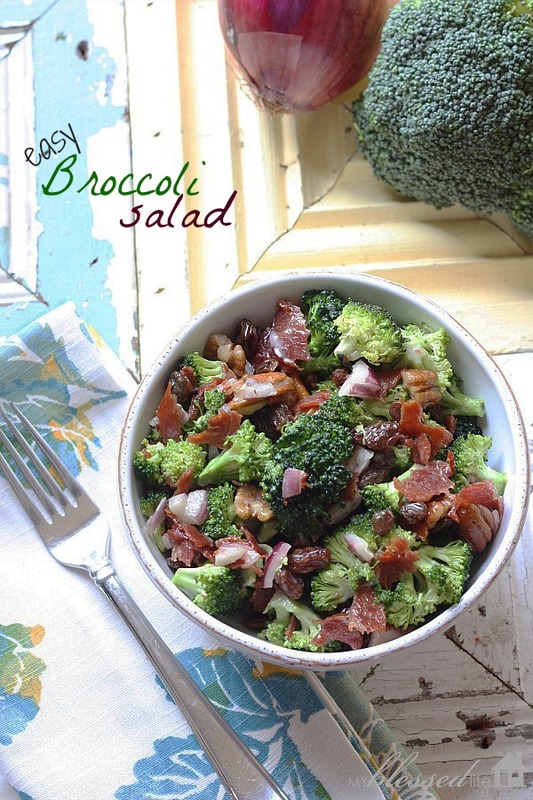 Broccoli Salad is a perfect salad to enjoy as the weather begins to warm up. 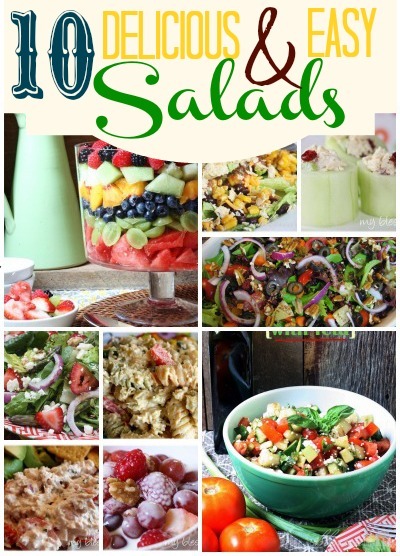 You might also enjoy this collection of 10 Delicious & Easy Salads! Do you enjoy eating salads? What kind is your favorite? Deffenitley will try this!! It looks soo yummy and it has bacon. For Broccoli use a bag of prewashed Broccoli flowers (cut in half or thirds) plus a bag of broccoli slaw. Also, for diabetics this works great with splenda. Instead of sugar, I use about 1/8 tsp of NuStevia Pure White Stevia Powder. Yummy. This is a great recipe – I’m glad to have a “less sugar” version! This recipe is also good with dried cranberries! Great recipe! We enjoy this often in the summer. Like your version with the reduced sugar. A friend gave me this recipe years ago, she didn’t use nuts but did use carrots and celery. I thought it was about the best thing I’d ever tasted. Her dressing directions were really vague, mix mayo, sugar and vinegar in a one cup jar. Great way to enjoy broccoli! my mom use to make something like this all of the time, I love it. Thanks for the recipe! I love this!! Thanks so much for this recipe. I am going to try this and I will let you know how it goes. I am new to blogging and still trying to get the hang of it. Thank you again! Oh by the way, I love your blog! LaCosta Gaston´s last blog post ..Today is a new day! It looks delicious! I’m wondering.. you put the broccoli uncooked? or you boil it a bit first?